Compare prices and find affordable car hire in Seattle. We search among multiple suppliers to find the cheapest prices. Unlimited mileage, the necessary insurance and tax are included in the rate given. 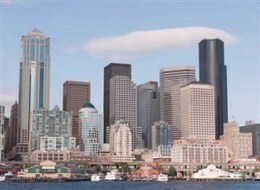 Seattle is the largest city in the state of Washington. The city boasts a population of 608,660 inhabitants (2010) and is 369.2 square kilometers in size. Seattle is known for its impressive music history. Jazz developed here and helped famous musicians like Quincy Jones and Ray Charles. The city is also the birthplace of Jimi Hendrix and the musical genre known as grunge, with bands like Pearl Jam, Nirvana, and Soundgarden coming out of Seattle. Seattle is also big on the indie rock music scene. Some of the things to see and do in Seattle include the Great Pacific Northwest Brewery Tour Company, the Seattle Art Museum, the Science Fiction Museum (home to the Science Fiction Hall of Fame), the Seattle Aquarium, and the Museum of Flight. There is also the Space Needle, Woodland Park Zoo, Gasworks Park, and the Waterfront Activities Center. Events in Seattle include Seafair, Northwest Folklife Festival, Capitol Hill Block Party, Fremont Fair, and Bite of Seattle. There are numerous trails for biking enthusiasts. This includes the Burke Gilman trail and “The Tapeworm” in Philip Arnold Park. Seattle, Washington is serviced by the Seattle – Tacoma International Airport (SEA) often referred to as Sea-Tac. It is located 2.4 kilometers from Interstate 5. Airlines that service this airport include Delta Airlines, United Airlines, British Airways, Air Canada, and Virgin Atlantic.